This women's AAA Grade Cubic Zirconia halo wedding set has an Engagement ring features a .46 ct (5mm) round cut center stone surrounded by 16 round stones to form a beautiful halo design. 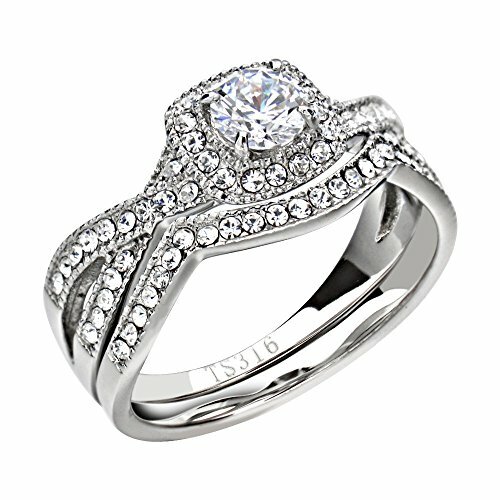 Sides of ring feature 30 round cut pave set stones. Matching wedding band has 24 pave round cut stones. Bands feature a designer style twisted look for a modern design. The total carat weight is approximately 1.90 Natural-Diamond equivalent. Stainless Steel is used in this fashion jewelry. It is an alloy with a minimum of 10% chromium content by mass. It does not stain, corrode or rust as easily as ordinary steel, and it is also hypoallergenic. Thus, it is extensively used in heavy gauge-welded components, such as jewelry. 316L stainless steel is of the highest quality for jewelry products. No-Plating is when the metal of the jewelry piece has no additional outer coating, and the metal is often polished to make it shiny and reflective. Synthetic stones are created artificially in a factory or laboratory, but have the same physical, chemical and optical characteristics as their natural counterparts which is Natural-Diamond. These stones usually have high luster, and is difficult to tell the difference from natural stones with the naked eye. If you have any questions about this product by FlameReflection, contact us by completing and submitting the form below. If you are looking for a specif part number, please include it with your message.